Put a smile on their faces with this tasty Halloween night family dish. 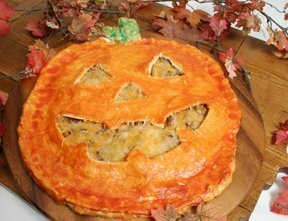 Create this fun Jack-o-Lantern pot pie to serve everyone before they go out to trick or treat. It will give them the nourishment they need to go trick or treating into the night. Check out our pumpkin carving patterns for ideas on a face to carve in the crust. See how to clean out a pumpkin to prepare it for carving your Jack-O-Lantern for Halloween. Select one of our pumpkin carving patterns to carve an extra special Jack-O-Lantern. The patterns can be printed for your use.